Jerry was born and raised in Stillwater, MN. He graduated from the University of Minnesota Mortuary Science program in 1979. He was employed at funeral homes in Willmar, Bemidji and Walker. In 1986, he relocated to Aitkin, Minnesota to work for the Brenny Funeral Home. He and his wife, Val, became owners in 1990. They have three children: Jonathan, Bethany and Mackenzie. Jason was born in Brainerd, MN and raised in Pine River, MN. His family owned Northland Funeral Home of Pine River and Pequot Lakes. He graduated from the University of Minnesota Mortuary Science program in 1997 and is a 3rd generation Funeral Director. He was employed at the Range Funeral Home in Virginia, MN and later returned to his family business. 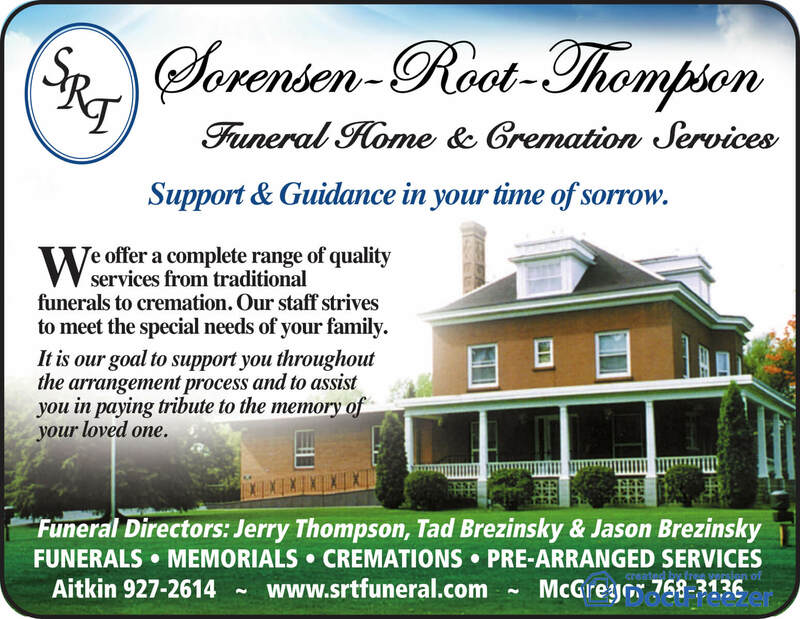 In 2000 Jason joined Sorensen-Root-Thompson Funeral Home and McGregor Funeral Home. He has three children: Jaron, Peyton and Brooklyn. Tad was born in Brainerd, MN and raised in Pine River, MN. His family owned and operated Northland Funeral Home of Pine River and Pequot Lakes, MN. Tad graduated from the University of Minnesota Mortuary Science Program in 1994. He began employment with Sorensen-Root-Thompson Funeral Home and McGregor Funeral Home in October of 2017.